Welcome to the entertainment hub of North Queensland; The Ville Resort-Casino. The Ville is surrounded by the very best views Townsville has to offer, overlooking the Coral Sea to the sunlit curves of Magnetic Island or out over the marina and the rugged landscape of Castle Hill. 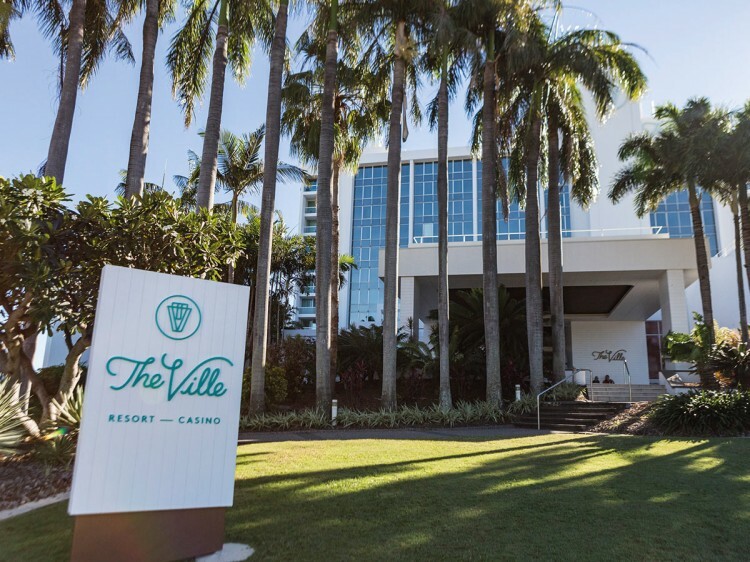 The Ville Resort-Casino has been an iconic venue within North Queensland since 1986 and features a gymnasium, restaurants, bars, conferencing and event facilities, regular live entertainment, and an international-standard casino. The Hotel also features 24 hour reception, room service, 300 complimentary outdoor car parks with full concierge services and valet parking, The Ville is 8km from Townsville Airport and is adjacent to the Townsville Entertainment and Convention Centre. Whatever your needs, The Ville has the room for you, offering a variety of hotel accommodation from Deluxe Rooms for the corporate traveller to Executive Suites for a special getaway. The Ville is on the doorstep to paradise. No matter how you travel - by foot, sea, air or car - The Ville is a comfortable convenient base for you to explore the Tropical North. The Palm House - Buffet restaurant. Alfresco dining. Live cooking stations. Change what you thought you knew about buffet dining. Showcasing the freshest produce tropical North Queensland has to offer with a little bit of contemporary flair. Guests can choose from indoor dining set in an open and relaxed atmosphere, or enjoy a meal outside by the infinity pool in the shade of the palm garden. Open daily for breakfast and dinner. Quarterdeck - Serving Cocktails and Dreams. 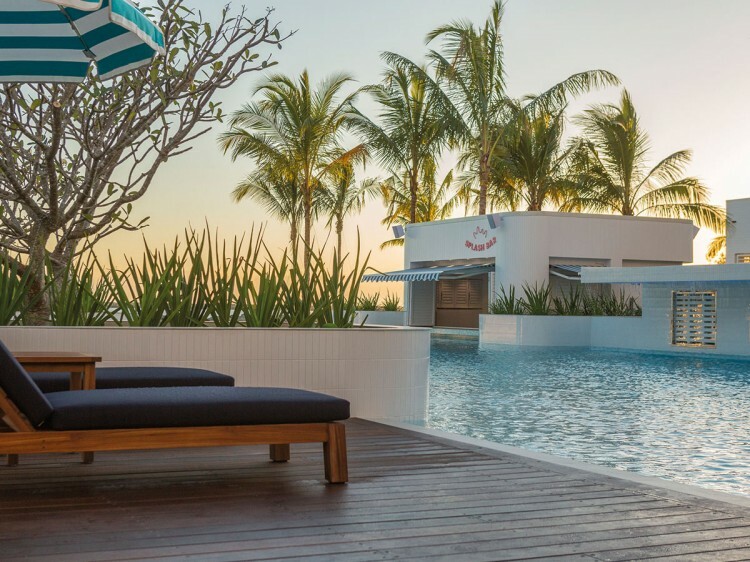 With its sweeping balcony, glamorous wrap-around bar and an abundance of comfortable lounge settings and tables, the Quarterdeck is the perfect place to come out and play on a Saturday, or just watch the palms sway to the sounds of a Sunday chill-out session. Menu includes share dishes, seasonal salads, variety of pizzas, seafood platters, burgers, tacos & NQ steaks + lighter options, bar snacks and refreshments. Open daily from 10am for lunch and dinner. Miss Songs - Food with personality! Let Miss Songs Asian Kitchen take you on a journey across the Orient. Discover classic Chinese dishes, food with south east Asian influences, edgy flavours that crescendo. Fresh, locally sourced produce, well-balanced flavours, classic Chinese dishes and south east Asian influences – this is Asian cuisine at its most satisfying. Open 7 days a week from 5.30pm. Splash Bar - It’s a dash of Palm Springs, a splash of Bermuda, and a whole lot of fun under the sun. 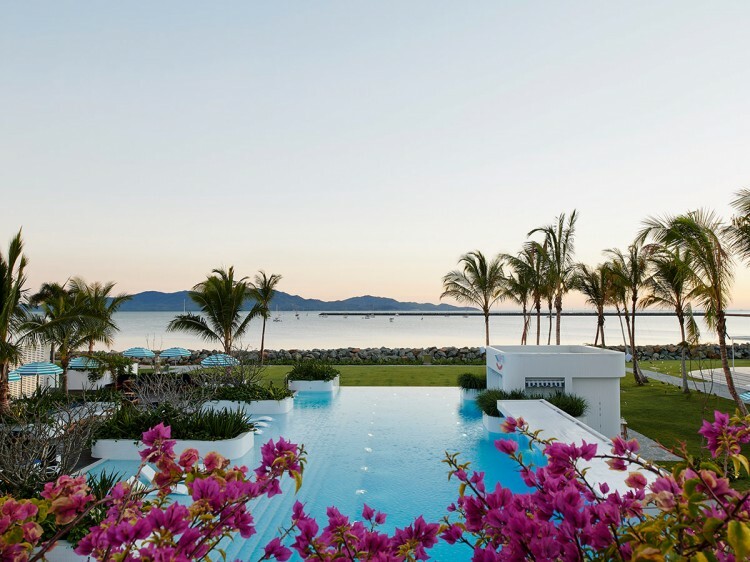 Located in a lush, landscaped oasis with stunning views of Magnetic Island and beyond, it's paradise under the palms. Open Friday, Saturday & Sunday. Spin Cafe - The choice for a quick morning or afternoon tea, café-style lunch or relaxed dinner. Located on the casino’s main gaming floor, all customers of Spin must be aged 18 years and over. Open daily from 9am until late. Main meals served between 11am & 10pm. Sports Bar - Located on the casino’s main gaming floor. Watch the latest sporting action on the big screen while enjoying a great range of imported and local wines, beers and cocktails. If you feel like a punt, TAB and Keno are adjacent to the Sports Bar. Guests must be aged 18 years and over to enter the casino. Hands in Harmony - For a truly relaxing visit, try Hands in Harmony, beauty and relaxation specialists. Offering a vast range of services from massages to wraps; indulge in a luxurious experience to help you unwind. Located on the middle three floors of the hotel - 14, 15 & 16. Marina or Ocean Views. Located on the top three floors of the hotel - 17, 18 & 19. Marina or Ocean Views. Free car parking. Valet parking available at a fee.